guaranteed to transfer to our network of 130+ partner schools. to talk with a StraighterLine Enrollment Counselor! 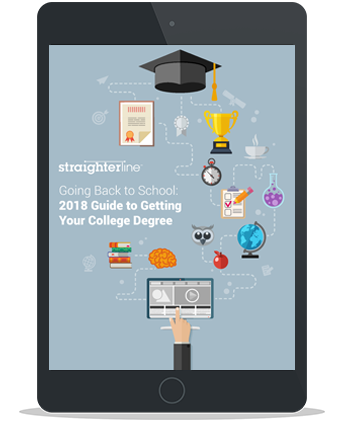 StraighterLine combines a $99 a month membership with guaranteed credit pathways to accredited colleges saving students up to 60% on their degrees. Complete your StraighterLine courses, and we guarantee that they will transfer to schools in our network of accredited colleges. Our FREE guide will provide you everything you need to know about going back to school, saving money on your degree, and your college options. *Total StraighterLine savings is compared to the average, in-state, published tuition and fees at a public four year college plus the average amount of contribution paid by state and local taxpayers. For 2014 - 2015, the average published tuition and fees is $9140 which represents an average of 47% of a public institution's revenue. Source: College Board and State Higher Education Executive Officers.